Gold, silver, and palladium futures ended lower Thursday. Gold’s loss was its first in three sessions. Gold for February delivery declined $4.20, or 0.3%, to settle at $1,279.80 an ounce on the Comex division of the New York Mercantile Exchange. "As usual, strength in the dollar would appear to be the primary culprit behind the weakness throughout the metals complex," MarketWatch quoted analysts from a report by Zaner Precious Metals. 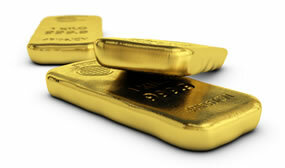 Gold futures ranged from a low of $1,275.30 to a high of $1,283.90. They rose less than 0.1% on both Wednesday and Tuesday. Elsewhere, silver for March delivery shed 8 cents, or 0.5%, to settle at $15.30 an ounce. Silver futures traded between $15.24 and $15.41. They added 0.4% on Wednesday and declined 0.5% on Tuesday. April platinum tacked on $8.60, or 1.1%, to $805 an ounce, ranging from $792 to $807.10. Palladium for March delivery dropped $27.50, or 2.1%, to $1,280.70 an ounce, trading between $1,275.10 and $1,314.30. Last Thursday, palladium posted a record settlement at $1,348.20 an ounce. Gold rose $3.90, or 0.3%, to $1,283.70 an ounce. Silver added 4 cents, or 0.3%, to $15.30 an ounce.